White clouds covering a bright blue sky, and a run down boat marina with rotting wooden light poles in a line, the album reads, "Andrew Altman." Knowing Andrew's work with Railroad Earth, I am immediately intrigued to hear what this 5-track debut solo album has to offer. It did not disappoint. Next up is "Sailboat," a slow acoustic number that features a lot of spacey synth and what I can only describe as “whale sounds” ambiently playing in the background. It creates a very unique texture for the track before the whole band kicks into an electric climax of the song. The final song, "Sing to Me," closes the album out perfectly. So much different from the other tracks, it brings an end to a full compilation of what the musical projection of Andrew’s mind is. With this song I feel that he isn’t trying to create any personality or recreate anything from the past. He takes his life’s musical and personal experiences to make something completely new. Tom Hamilton’s drum work on this song also helps make it stand out amongst the rest. What I enjoy most about the entire album is its soothing sound. You can relax to this album. This is an album you could listen to on a walk to get your mind back at ease. It allows you to enjoy the music as well as take a quick look into your own mind, creating your own interpretations. Overall, the album is wonderful. It’s an easy listen, while being something completely on its own. I’m very excited to see what Andrew has in store for future albums. I was lucky enough to have a nice chat with Andrew about the album and what’s in his future. Jesse Filippelli: What made you branch off from RRE to create your own album on the side? 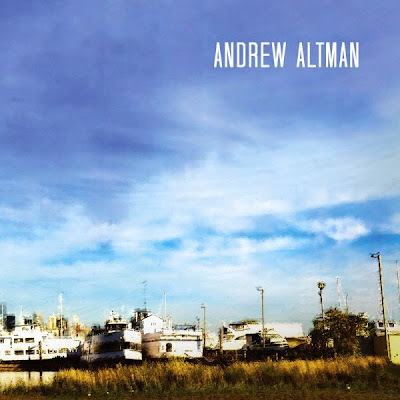 Andrew Altman: I reached a point playing bass where I was comfortable playing just about anything in the style that I play in. There are some heavy jazz gigs that I probably couldn’t hang on, but everything else I felt pretty good about. So, I wanted a new challenge and started song writing and working on my singing. In the past, I wasn’t a very good singer; so that gave me something to work on everyday and I improved. I started writing songs about six or seven years ago, and actually contributed a song to the last Railroad Earth album before I even put out my own album, "When the Sun Gets in Your Blood." It was one of those band things where I said “Hey Todd [Sheaffer], why don’t you sing it,” and John Skehan contributed to the bridge. I wrote all the rest of the lyrics and progressions. It was just a way to challenge myself, and I had a bunch of tunes lying around. Once I found a studio situation that worked, we went in there and laid them down. Jesse: Is this the first album you have produced aside from RRE? Andrew: Yea, like I said I just had the songs written and ready to go. I finally felt like I had the resources to put it out there. Jesse: Who plays in your studio band? Andrew: No, that’s the interesting thing. Tom Hamilton (Guitarist of American Babies and Joe Russo’s Almost Dead) produced the whole thing and I thought we would maybe be bringing in a drummer and a keyboardist, but Tom was like, “Just trust me.” So he sits down at the drums and I ask if he plays. Tom just goes, “Oh, you’ll see.” You know, he’s not the kind of drummer you would hire for a gig, but in the studio he gets in there and holds it down. Tom also does a lot of the guitar on the album. I’m playing the rhythm parts, but the lead guitar, drums, keyboards, and all of the studio created instruments is Tom. Jesse: How would you describe your music to someone who has never heard your music before? Andrew: Huh. Let's see, how would you say it. Song based rock? I’m not sure, that’s always a hard question. When you're putting out an album there are all these things you have to do, and they ask you a question at some point to list some other artists that are in your genre. For the first two tunes (Better Man and Sailboat), I’m a really big Ryan Adams fan, and I think you can hear that in those songs. At the same time I’m also a big fan of My Morning Jacket, which you can hear that in "Mother May I." The last song, "Sing to Me," I don’t even know. It’s hard to really answer the question. Jesse: What label was the album released under? Andrew: I did it under Black Bear Records, which is the Railroad Earth studio. There’s not much to the label, but that’s where the last Railroad album came from and that’s where we released our Red Rocks 2014 DVD through. Jesse: Yea, I was actually a photographer for that Red Rocks performance. I gotta say, as a fan, I had an extremely emotional musical moment at that concert. It was beautiful. Jesse: Getting back to the album, what’s your favorite song on the album? Andrew: Initially, I put the order of songs together, and I put "Better Man" first because when I was listening to the mixes I heard that and felt like a listener, or at least that was the vibe it was putting out. It just had a pop that stood out. I actually like all of them, which is rare, because a lot of the times you put out an album and there might be a song or two that you’re just kind of iffy about, or even songs that I’ve written and just not liked. On here though, I feel really good about all of them. "Sing to Me," the last tune, is the one that everyone comes up to me and tells me that is their favorite. Jesse: What inspired "Better Man?" Sounds like a relationship put you in a place where you wanted to improve yourself. Andrew: It’s not necessarily about, but for someone. The thing that inspired it was a new feeling to be thinking not only about how much I care about them, but that I want to be a better person for them. Then creating a better us. Jesse: What’s next? Can we expect another album? Andrew: For sure, I already have enough songs ready to go for another album. It’s just a matter of finding the right time and studio situation. Railroad Earth is still without question a full time gig, so whenever I have off, I just have to cram in anytime I can. Jesse: So when should we expect a Railroad Earth Red Rocks announcement? Andrew: Oh yea, that’s coming soon! We have dates locked in; we are just working on locking in our support situation. We think it’s going to be very cool for us. We are trying to do something different with the show. There is always such amazing support out there since we stepped out on our own and started headlining gigs there, so we are trying to go out of our way to find something that is going to give each show a twist, whether is be a certain opener or a special guest playing with us. Download The Album at www.cdbaby.com/cd/andrewaltman!